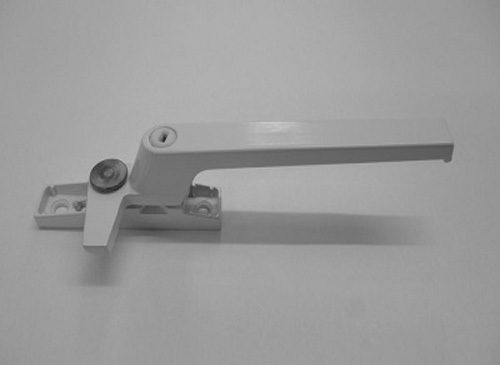 The first window handle design to be used on a uPVC casement window and the concept differed little from the handles found on a timber window or referred to as window latches. The cockspur handles action is simple as turning the handle forces the nose of the handle across a wedge shaped block to tighten the window. This differs from the window handles found on timber windows where the nose of the handle can close into a keeper block as opposed to closing over the wedge block. There are various sizes of handles so the step height has to be judged carefully when replacing the cockspur handle. Wedge blocks can be replaced to a thicker or thinner size so this gives the adjustment needed when replacing a cockspur handle with a different 'step height'. The 'step height' is the gap under the nose of the handle.